The Falcon 9 rocket and Dragon spacecraft launch from Space Launch Complex 40 at the Cape Canaveral Air Force Station in Florida on May 22, 2012. CAPE CANAVERAL, Fla. — Scotty has finally been beamed up. The ashes of the actor James Doohan, who played Scotty on the 1960s television series "Star Trek," were launched to space this morning (May 22) on a SpaceX Falcon 9 rocket. 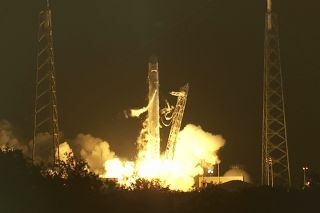 The unmanned Falcon 9 blasted off at 3:44 a.m. EDT (0744 GMT) from here at the Cape Canaveral Air Force Station, carrying the Dragon capsule filled with cargo bound for the International Space Station. Also packed aboard the rocket was a secondary payload carrying remains from 308 people, including Doohan and Mercury program astronaut Gordon Cooper, according to ABC News and Reuters. The human remains payload was not officially announced by SpaceX before today, although news reports publicized the inclusion of the ashes onboard Falcon 9. "So much for our 'secret' launch," Charles Chafer, CEO of Celestis' parent company, Space Services Inc., wrote on his Facebook page Sunday (May 20). However, the payload was apparently secret enough to fool SpaceX founder and chief designer Elon Musk. SpaceX's Falcon 9 rocket launches the unmanned Dragon capsule into orbit on May 22, 2012. Today's SpaceX flight was the company's "largest launch event ever," according to Chafer's Facebook page. Dragon launched Tuesday after an earlier attempt at liftoff was called off at the last second due to an engine valve problem. The issue was fixed and the vehicle had a smooth blastoff into the predawn skies here on the second try.